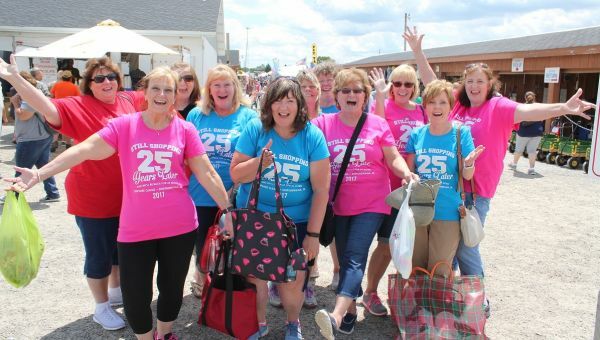 The Shipshewana Flea Market is a do-not-miss Hoosier tradition with nearly 900 booths in an open-air market covering 40 acres. The vendors are open 8:00 am-5:00 pm every Tuesday and Wednesday, May through September. Also open Memorial Day, 4th of July & Labor Day! Auctions are held every Wednesday and Friday, year round. Vendors offer a variety of products and truly have something for everyone – quirky novelties, fresh seasonal produce, crafts, home decor, dollar items, clothes, garden supplies, cleaning supplies, beauty essentials, paper goods, jewelry, snacks, accessories, games, books, toys, furniture, baked goods, signs, silk flowers, t-shirts, pet supplies and everything in between. Open rain or shine. There are food courts, a sit-down restaurant and rest areas throughout the market. Shipshewana Flea Market scooter rental is available. Parking is $3.00 per vehicle (Starting Memorial Day); Admission is free.